The touchscreen has two operational features. First, one can interact directly with the content displayed on the device, instead of indirectly by using a cursor controlled by a mouse or touch pad or some other intermediate device that would need to be held in the hand. Secondly, the technology displays can be attached to computer screens, or to networks via terminals. Touch technology plays a significant role in the design of smaller digital appliances like a personal digital assistant (PDA), satellite navigation devices (GPS), mobile phones, and even video games. 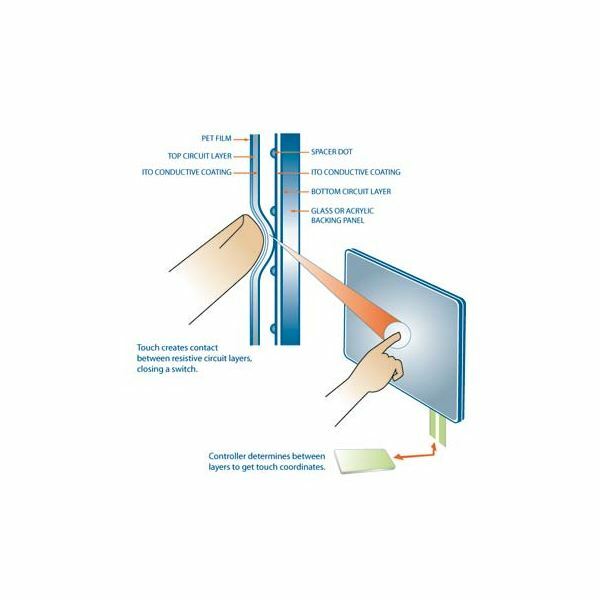 The resistive system has a standard glass panel covered with two metallic layers, one conductive and one resistive. Microdot spacers separate the two layers. Finally, a scratch-resistant layer is added above the glass screen for protection. A charge from an electrical current makes the touch system dynamic. While the monitor is on, the current passes through the two layers. As the user touches the screen, the two layers make contact at that spot. The contact point now makes a change in the electrical field. The coordinates of the contact point are calculated by the CPU. Now the final stage takes place. A software driver will convert the coordinates into a form that the operating system can recognize. This is similar to the process used by a computer mouse driver when a mouse's movements in a drag or a click are put on the screen. The technology of the surface acoustic wave system is different from the other two. Here, two transducers, a sending and receiving. They are placed along the monitor's coordinate axes of the glass plate. Reflectors also end up on the glass plate. The electrical signals sent from one transducer are reflected back to the other. The receiving transducer will be able to determine whether the signal was disturbed by a touch event at any instant, and can find it immediately. This is the technology that is used on Windows 7. In the capacitive system, there is only one layer. It stores the electrical charge on the glass panel of the monitor. 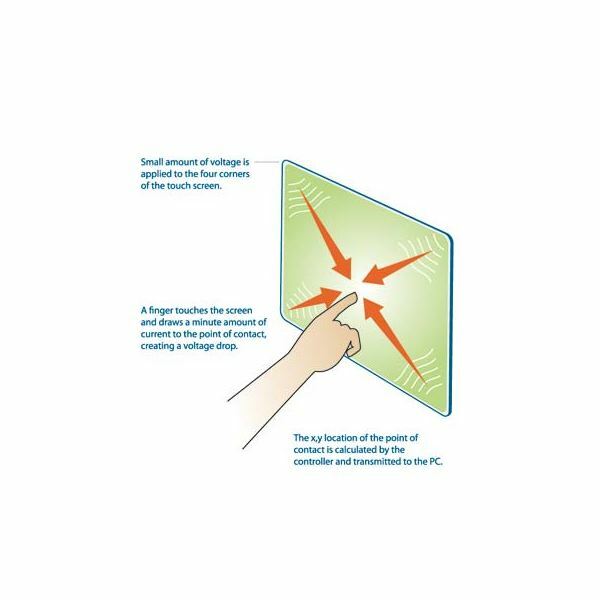 As the user touches the monitor with a finger, charge is transmitted to the user, making the charge on the capacitive layer lower. This lower level is measured in circuits located at each four corners of the monitor. The computer calculates, given the relative differences in the electrical charge at each corner, the exact spot where the touch event occurred. It then relays that information to the touch-screen driver software. Touch technology is not new to Windows. However, the Windows 7 features extend it to all areas of the PC. To make it more user friendly, the taskbar and start menu now have larger, fingertip-friendly icons. Many programs also have a touch-ready look and feel. Microsoft has been working with touch technology for years, but with the advent of their newest Operating System, they felt that the time was right to extend this technology to Windows7. The failure of Vista made it more urgent that they show consumers that they were going to be on the cutting edge of this technology. You can read more about touch technology by looking at the Top 10 Touchscreen Monitors. Windows7 use touch technology to expand the range of uses that are available on the monitor. The keyboard and mouse technology that have been around for over 30 years are now being challenged in different ways. Touch is one way to get the users to interact with the programs and expand the range of the operating system on the hardware. 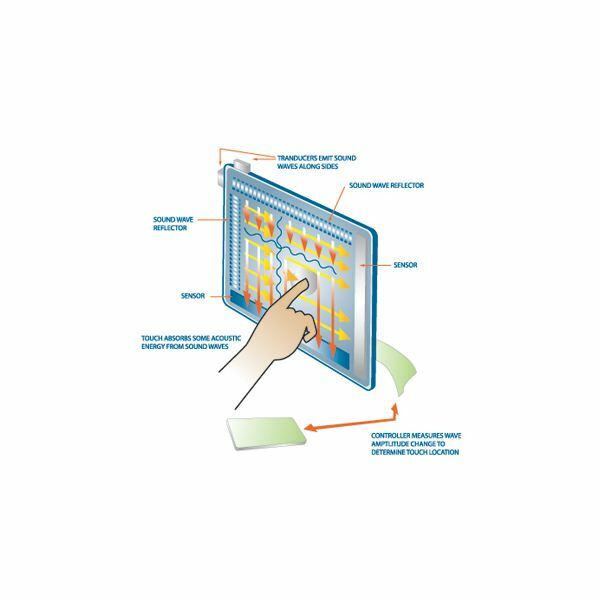 For more information and articles about this technology see Touchscreen Technology – How it Works.